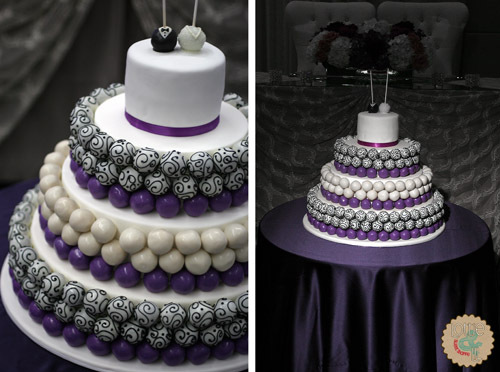 This couple knew they wanted cake pops for their main wedding dessert and wanted them to match their wedding design. 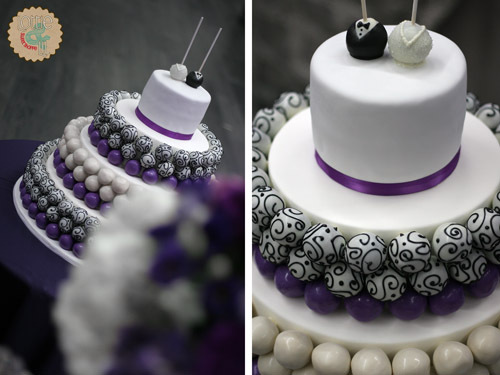 Purple, white, black swirls and GRAND were the inspiration for their cake pops. The final design was a cake pop wedding cake using the pop design and color to indicate flavour. The top tier was a decadent chocolate cake for the couple to keep for their 1st anniversary and bride and groom cake pops for the couple to feed each other. Their dessert was a spot-on match for their wedding day! This entry was posted on Friday, November 2nd, 2012 at 7:35 am	and is filed under Wedding Pops.